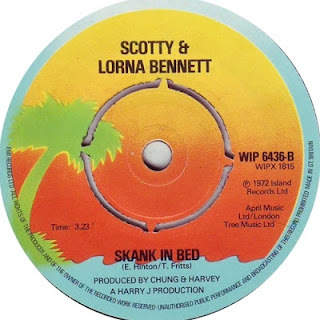 Ah, Scotty and Lorna. This is a classic toasting. I remember listening to this song over and over the first time I heard it. Loud, through great big speakers. Good God! “Ahy!” Scotty squeals and away we go with Scotty skankin’ and rankin’ and hootin’ and a shootin’ lines. “One time,” Sotty slips in. “Your face is a mess.” Lorna finishes the line. And the back and forth continues, her sweet melodies calling and his smooth, sly replies. Then all of a sudden, Scotty stops the band. Cut! Cut! Cut, cut! Tell me somethin'. whadda ya’ll doin' in the studio?" A quiet voice replies, "I used to live in the restroom, suh." “No suh,” the man says.